When I was in the basement of the house I grew up in and played around with electronics, the transistor was mysterious to me. In the pictures of the circuits I wanted to build – I saw these weird names like BC546 or 2N2222. And when a schematic told me to use the BC546, I used that one. I didn’t dare to try anything else. It took me a while to understand how to pick a transistor. I’m still no master, but I know a few essential things that help me in deciding. Most common transistors can handle up to at least 100 mA of current through it. So if you need to control a current of 500 mA, you need to check if the transistor can handle that much. If you need a transistor that can switch on and off really fast – like tens of thousands of times per second – then you also need to make sure your transistor can handle that. 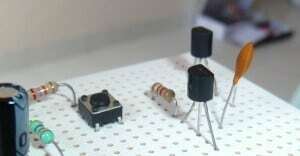 But how do you know if a specific transistor have these things? …but more on the datasheet tomorrow. In many, many cases – all you need is a common purpose transistor. Either NPN or PNP. But you can’t mix up these two. If the circuit diagram says NPN, then you need an NPN. Now, go and get yourself a transistor!